This post is contributed by Letitia Henville, presently preparing a PhD (Univ. Toronto) on late nineteenth century ballad translations. I never found the missing manuscript, and if anyone reading this happens to know where it is, I’d love to hear from you. What I did find in New Haven, though, were two puzzle pieces that have helped me to better understand the context in which Stevenson made his translation. This first of two posts describes the first puzzle piece: a page of manuscript with almost no words on it. I now believe that Stevenson meant to “not consciously change” even the meter of the poem—that is, that he attempted to reproduce Tahitian rhythms in his English-language text. While some of the poems that Stevenson wrote before his South Pacific travels feature strong ballad rhythms—the anapestic trimeter lines of “Ticonderoga” (“This is the tale of the man”); the alternating tetrameter and trimeter lines of “The Counterblast Ironical” (“A clear account writ fair an’ broad, / An’ a plain apologie”), both of them rhymed ABAB—the meter of “Song of Rahéro” is unusual. It has long hexameter lines (six-foot, six-beat), and these in addition consistently lack a strong central caesura; in a private letter to a friend, Edmund Gosse said, of “Rahéro” and the collection: “the versification is atrocious.” That Stevenson could write strong ballad rhythms but chose not to for “Rahéro” seemed, to me, significant. “Yottowas,” so spelt for convenience of pronunciation […] Námunu […] [is] pronounced […] dactyllically. Such comments show an interest in the sounds and word-stress of Tahitian words by a careful observer who would undoubtedly also be interested in Tahitian metrical patterns. Reverse of “Song of Tefari [sic],” McKay 6888, Beinecke Rare Book and Manuscript Library, Yale University. A quick check showed that the scansion on this page does not correspond to the English-language versions of the Tahitian songs on the reverse. The columns of numbers on the right, which appear to count numbers of syllables (one column reads “10,” “12,” “12,” “7,” “12,” “12,” “8”) and numbers of metrical feet (the other column reads “4 feet,” “6,” “6,” “6,” “6”), indicate long lines, frequently of six feet. I asked myself: could this be the key to unlocking the meter of Stevenson’s strange hexameters in “Rahéro”? The answer, in brief, is no: these lines of scansion can’t be directly mapped on to Stevenson’s “Rahéro”. 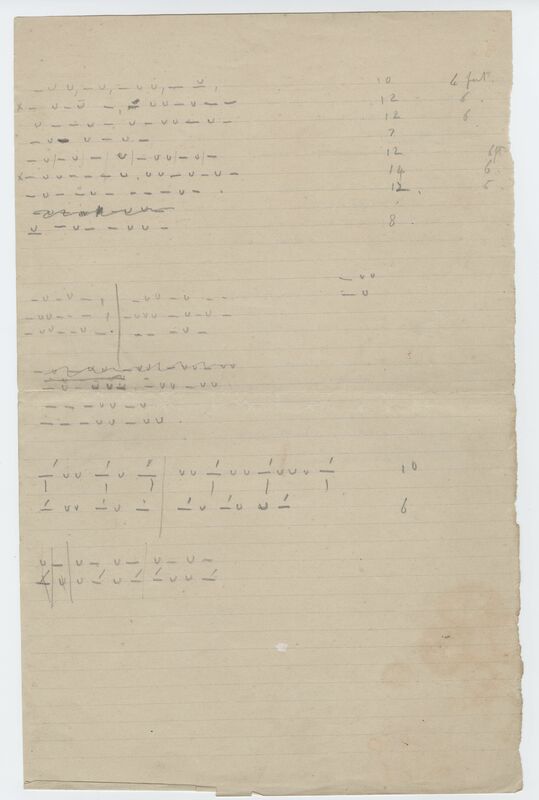 But rather than a metrical analysis of his own poem, I believe these lines to be Stevenson’s attempt to transcribe the rhythm of a choir of Tahitian singers. In his letters, Stevenson mentions listening to choirs of himene singers; anthropological evidence and late Victorian accounts of Tahitian choirs both suggest that himene choirs practiced their songs multiple times. So, rather than hastily jotting down rhythms, struggling to keep up with the song, Stevenson would have had time to revise his scansion as he listened to the chorus’s repetitions; the corrections, revisions, and attempts at finding patterns in the rhythm evident on this page may have been based on listening to the same passage multiple times. Certainly Stevenson was an able musician: John Russell’s “Music of Robert Louis Stevenson” makes this fact abundantly clear. Even with his sensitive, musically-inclined ear, however, Stevenson seemed to have struggled to detect any underlying pattern in the singing. And so, I’d suggest, the lack of consistent rhythm in “Rahéro” may be one of the ways in which Stevenson attempted to accurately convey the “song,” without “consciously chang[ing] a single feature”.